Opening day is a magical phrase to most hunters. However, many bow hunters stay out of the woods until temperatures drop and the rut kicks in. The rut may be the best time to see deer all day but early season bow hunting can offer great opportunities to put a buck on the ground before deer become pressured. These six early season bow hunting tactics can fill your tag before most hunters buy theirs. Walking into the stand with a jacket on during a warm autumn afternoon is going to lead to a lot of sweat and even more scent. Carry your jacket in a backpack and walk in with a light layer to stay cool. Scent is bad but the biggest scourge of early season bow hunting is mosquitoes. A ThermaCell is required equipment for early season hunting. Without one you’ll spend most of your hunting hours swatting skeeters. I often preach the advantages of great scouting. However, early season bucks are generally set in their ways unless they are disturbed. Keep intrusion to a minimum. Unless a property has undergone a major habitat change or crop rotation, deer are likely to bed and feed in the same areas they did in years past. This is why it is important to keep good post hunt notes. Use last season’s hunts as early season scouting. Bucks are not as nomadic in early season as they are during the rut. Generally, if you find fresh sign there is a good chance the deer that made it lives close by. If you find big rubs or scrapes, you can rest assured that a big deer is using that area. Conversely, if you’re only finding small rubs it doesn’t mean you won’t see a large buck. Bucks are often still in bachelor groups during early bow season. It is not uncommon to see a trophy buck running with younger bucks this time of year. One of the toughest parts of early season bow hunting is bucks aren’t chasing does tenaciously yet. That can also be an advantage. Deer move through cover much slower in September than they do when bird-dogging a doe in November. Take your time before you let an arrow fly to allow a buck to move into your opening. Take a look around too. You might feel good about that 130 inch buck when you hit your release. But when a 180-incher runs past after he hears the thwack of your arrow in his buddy, the original deer shrinks dramatically. Early season bucks follow the bed-feed-bed cycle fairly closely during early season. If they are not pressured they tend to pattern consistently. Morning hunts should be closer to feeding areas than bedding areas and evening hunts should be closer to bedding areas. Bigger bucks will be last to leave bedding areas in the evening and if your stand is set up right on the feeding area, you probably won’t see the big boys. Even worse, when you climb out of your stand there is a good chance you’ll spook big deer entering the field. Hunting water sources is great early season strategy, especially during dry years. However, setting up a stand over a pond or creek is usually not the best way to hunt water. Find the trail bucks are using to get to the water and set up there. Bigger bucks are hesitant to expose themselves in the open during daylight hours. If you want to arrow the big boys, wait for them as they wait for dark. As is the case with deer anytime of year, they are apt to do just about anything at any time. The only thing predictable about a big buck is his unpredictability. 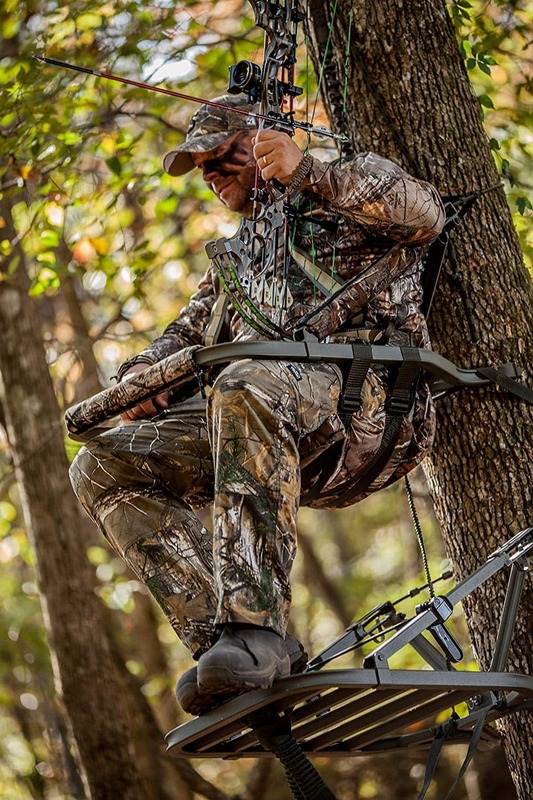 The best tip for early season whitetail success… be in the stand, not on your couch.